Cholesterol is not a monster that’s going to hurt everyone. It is an essential part of our nervous system and brain. Majority of the required cholesterol is internally manufactured by the liver. Some amount of external cholesterol enters our body through foods like mutton, egg, chicken, fish, dairy, etc. As long as your blood cholesterol is within normal limits, there’s no harm in eating cholesterol containing foods in limited quantities. The health risks begin when the blood cholesterol goes above normal levels. What are the normal numbers of cholesterol? LDL Cholesterol – also called ‘bad’ cholesterol, can build up on the artery walls and increase the risk of heart disease. The lower the number, the better off is your heart. 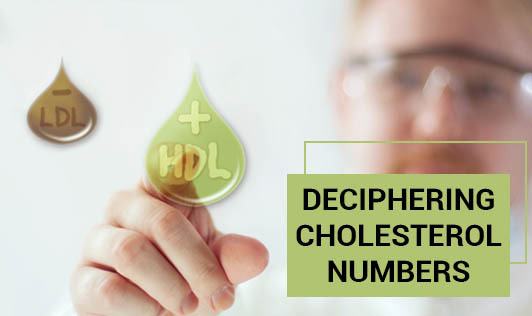 HDL Cholesterol – also called ‘good’ cholesterol, protects your heart by scavenging LDL out of your blood. The higher the number, the better off you are. Total Cholesterol – is a measure of all cholesterol types put together. Triglycerides – although not in the cholesterol category, it’s a type of blood fat which also increases the risk of heart disease when it’s higher than normal. The above numbers are only indicative. Cholesterol and triglycerides should be checked every 5 years, or more frequently if there are risk factors involved. Please check with your cardiologist what is reasonable for you.